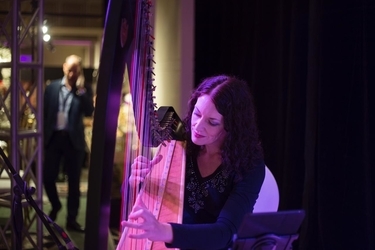 Devon Carpenter, harpist, is a professional harp player providing music for weddings and events in Riyadh, Medina, Mecca, Jeddah, Dammam, and throughout KSA and the Middle East. The elegant music of the harp is the perfect addition to your wedding ceremony, reception, or party. Please book flights to arrive no later than 24 hours prior to the beginning of the ceremony to allow for transport delays. Departure flight must depart no earlier than 4 hours after I finish playing. We will be in touch to discuss the availability of specific arrival and departure days and times based on my schedule. In lieu of checking the harp as baggage, you may arrange for ground transport of the harp from Abu Dhabi. Ground transport vehicle must have a large enough cargo area to accommodate the harp in its case.